(CNN) -- Walter Marino shouted to his 12-year-old son, Christopher, as he drifted farther away in the Atlantic Ocean. 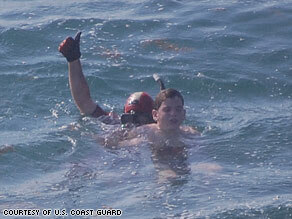 A Coast Guard crew found Christopher three miles away from where his father was rescued. After four hours, the currents picked up, and Christopher began to drift from his father's reach. Because of the darkness, they couldn't see each other. So Marino shouted out part of a phrase to his son.